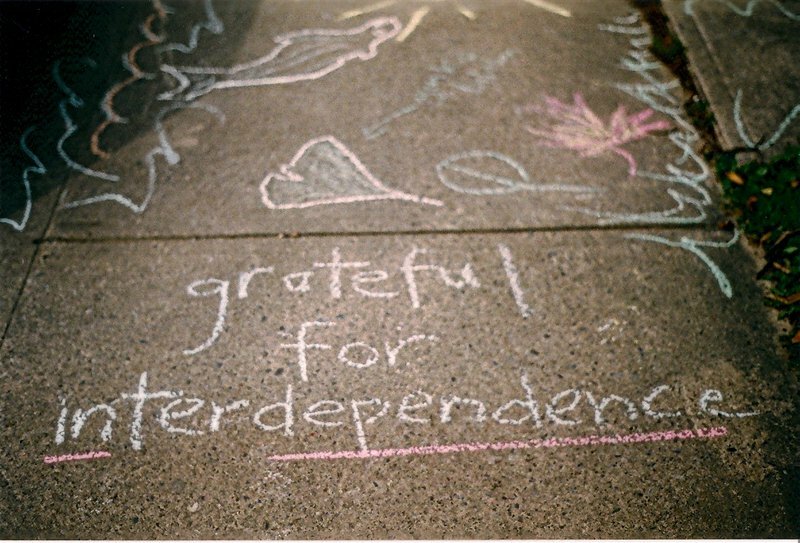 We are all interdependent, but a person’s economic situation determines whether dependency is seen as acceptable or not. Credit: Flickr/lambs.frances. CC BY 2.0. The Bonfire Night video has been linked to immigrant bashing, but more widely it reveals a disregard for the lives of social housing tenants in general. The journalist Owen Jones argues that this is the product of the systematic dehumanisation of poor people in this country. It’s good that people are feeling outrage about such disregard and the cruelty of UK welfare policies, recently condemned as ‘punitive’ and ‘callous’ by UN Envoy Philip Alston. But is outrage at a few ‘hateful’ video-makers and politicians enough? In rightly condemning the callousness of the Bonfire video we take comfort in the idea that we’d never do anything like that ourselves, or that we’d never introduce something as cruel as Universal Credit. We’re not so sure. Should we let ourselves off the hook so easily? After all, callous narratives have become routine in debates about UK welfare policy. Remember ‘strivers versus scroungers,’ or those who ‘do the right thing’ versus those who ‘cheat the system’? Such language hasn’t just been used by conservatives. In the run-up to the 2015 general election Liam Byrne, the-then Shadow Work and Pensions Secretary, argued that Labour had lost the previous election because it was seen as the party for ‘shirkers’ not workers. Only since Jeremy Corbyn became leader has Labour refused to shore up this narrative. Such language has devastating effects on people. “When they talk about scroungers” says Sonia, one of the members of the network, “they mean me. They assume because I need financial support I’m lazy. They don’t know me or my situation.” Hazel told us how her autistic son has picked up on such derogatory language: “He feels stressed, anxious, inadequate. Like a failure because he has to do things slowly and says ‘mum, will people think I’m lazy?’” “I get it,” says Sonia, “I’m nobody.” “You feel worthless, pointless” adds Jo, another member. Binaries like ‘shirker and worker’ would be unacceptable if they were used in terms of race, gender or sexuality, but in the context of poverty they are rarely challenged. How many of us speak out against the skiver/striver language to show politicians we won’t stand for it, or the policies it justifies? As with many seemingly innocuous phrases which are loaded with prejudice, ‘hardworking families’ passes easily unnoticed. But sociologist Stephen Crossley argues that this term sets up an insidious binary against so-called ‘problem’ or ‘troubled’ families that are repeatedly presented as a burden on taxpayers. This framing has allowed the government more room to push through a punitive ‘culture change’ in the UK welfare system. Different standards are applied to people who are financially comfortable (like the two of us) and those who aren’t. We’ve both made plenty of choices that didn’t work out, but we had a safety net and influential friends which protected us from any terrible impacts. Our ‘bad choices’ are seen as positive learning experiences, not things that should be criticised because they show that we’re dependent on other people. In reality we are all interdependent, but a person’s economic situation determines whether dependency is seen as acceptable or not. Our jobs pay enough to choose childminders we’re happy with, but lots of people’s don’t. They can’t pick a place where their kids will be as well cared for as with them, so they take on less paid work. Does that make them less responsible? According to current welfare policy it does. People who weren’t born into financial stability may need state support more than people whose parents gave them a deposit for a flat, or who have the advantage of well-placed social networks. Does that make them irresponsible? According to current welfare policy it does. Why don’t we question this language? It’s difficult to say. The campaigner Simon Duffy suggests that the hardworking families rhetoric appeals to the “fears and anxieties of the middle-classes by identifying weak groups who can be easily blamed for society’s problems.” But perhaps it’s simpler than that. Perhaps we all tend to buy into what makes us feel okay about ourselves and justifies our privilege. The anger and compassion unleashed by Grenfell and by Philip Alston's report on UK poverty will only be transformative if people use it to examine themselves and their decisions: why have we failed to challenge the language and policies that drive the UK welfare system? Why has it taken such extreme events to wake us up? Why have these dehumanising narratives been allowed to persist for so many years? And what are the blindspots that lead people who care about social justice to unwittingly collude with oppression? “Unless you feel connected to it,” Sonia warns, “you stop caring, you don’t have that drive.” Only by challenging ourselves in this way can we reach a deeper sense of connection and shared humanity, the things that are needed to build lasting solidarity and change.